While at the farmer's market this past weekend, I ran into some wonderful treasures!! We arrived home with the scent of fresh, warm, soft pretzels still lingering on our breath and our bags stuffed with abundance- peaches...strawberries...green onions...purple, red and white fingerlings...prosciutto, smoked swiss and freshly baked red pepper focaccia from the Italian deli tucked inside the market...apples...fragrant basil, rosemary and thyme...and the fabulous little treasures that I don't find often- FIGS and Ruby Red CURRANTS! They're like sparkling little jewels...I was soooooo overjoyed! The kiddos didn't remember ever having currants before. So, they poised themselves...held a little bubble of exploding warmth...and popped it in! Reaction....POW! Tart, yet sweet. I don't know if you can see it on their faces or not, but they liked them. We ate about half of them straight-up! The other half I decided to pickle and can. I'm not sure if I actually did it right or not, because this was my first time trying to do anything with them besides make a jelly. I used a recipe I found in Chez Panisse Fruit by Alice Waters. She actually says to pack the fruit into jars with self-sealing lids. Are these different from normal canning jars (I'm still just getting comfortable with canning at home...branching out)? Well, I used the normal method of canning and the currants puffed up...from the heat, I'm sure...which is what makes me wonder if self-sealing is different? Either way, they're gorgeous and I can hardly believe I have to wait 6 weeks to find out how it actually worked. I'll keep you posted. If nothing else, I'll have some fabulous currant vinegar! 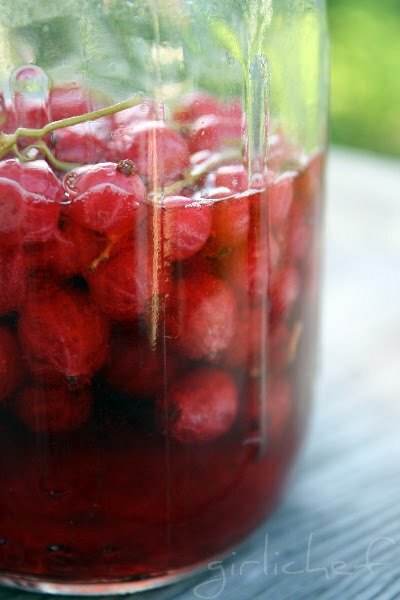 Strip the currants off their stems-or leave them be; unstemmed, they make a pretty garnish as little branches of fruit. Bring the vinegar, sugar, allspice, and cloves to a boil and simmer for 5 minutes. Let cool. Pack the fruit into canning jarss with self-sealing lids prepared according to the manufacturer's instructions. Pour the cooled vinegar over the fruit and seal. Let sit in a cool, dark place for 6 weeks before serving. My other treasures I simply wanted eat warm and seedy and wrapped in salty prosciutto...with a little mint from my yard. Perfection. Have you run into anything unexpected and wonderful at your Farmer's Market or through a CSA or community garden lately? What was it and what did you do with it....create or simply enjoy? *If you missed the Two for Tuesdays announcement and wonder what it's all about, just click on the badge or HERE and it'll take you to the explanation page!! I have never had currents before like this either! It must have been a blast watching the kids! They look gorgeous, great photos! Thanks! That really is the best way to eat figs...fresh currants are near impossible to find here...lots of figs, but I don't believe I have ever had a fresh currant. Red currants are so fresh. Great to make some ice cream with them. I tried eating fresh redcurrants once, they are so tart! I'm pretty sure self sealing and regular canning jars are the same, but I'm not a real canner so I can't be sure. Natashya or Pam would know! All I want after reading this is a nice plump fig! Currents and figs--how fun. I bought some fresh currents last year at Whole Foods--couldn't resist and I made a cold fruit soup with them. Hopefully we will have local figs soon here. I just linked my Parsley Salad w/ Tahini Dressing (& Homemade Tahini) to T4T this week. I was so excited to make my own tahini--so easy and much cheaper here. The self sealing jars are just regular canning jars. The lids self seal when you boil the jars to create that vacuum seal as opposed to using jars for jam where you have to add a coating of wax on top of your jam to seal it in. You found prosciutto at a Farmers Market? I want to go to yours! Red currants will occasionally grow wild here and will forage. It does make the best jam - especially when combined with other berries. The photos are all enticing. Everyone looks like this outing is the best outing ever! I have three currant bushes in my yard. Never know what to do with all of them. I am going to try this recipe. Thanks for the inspiration. Hey, there! I am really enjoying your blog hop. :) I am sharing two things from my kitchen this week - a sprouted lentil slaw (great for summer meals!) and a sourdough spice cake. Angie...yes, I was thinking ice cream. Saw a recipe for coating the currants in sugar and using them as a garnish...perfect on top of ice cream! Deb...oh, a cold soup is a fabulous idea! Claudia...we have a wonderful little Italian deli in our market...wonderful meats, cheeses, salads, breads, etc!! Sweetlife...so happy to have you with us! Bonnie (r u the same sweetlife or a diff one?? confusion...LOL)...Awesome!! I'd be in heaven! Bella...sorry, forgot to say thanks to you! Thanks ;) Your dogs are sooooooo precious! The kids faces are too cute! I've never heard of pickled currants - I can't wait to hear how they turn out. I bought currants last year at the market and made a curd with them, and popped it into tarts. It was alot of work, but very rewarding - yum! I just pickled some red onion and cucumbers, and never had this happen, but they turned my cucks red! Kind of cool- wish I could get currents here, hubby would dance about the kitchen! Yours look great- cannot wait to see what you do with them! Thank you for hosting! This is my first time posting. Gotta love those recipes! I see a few i would love to try. Heather, Can I just say how gorgeous your children are! Sorry but those eyes on your son won the show on this post! Besitos!! There was a fig tree where I went to college in California. But we never ate a single one! We thought they were a nuisance because they fell to the ground and got trampled, then tracked over the carpet. If only I had known! Now I would love to have luscious sweet figs! Your kids are too dang cute! the figs looked good. We never get good stuff like that at our Farmers Market... High Desert Living, you know. Your red currants are so beautiful and one of my favorites for using in glazes. I would have never thought to pickle them but it sounds like an excellent idea! Happy to lend my entry to the Two for Tuesday Blog Hop! I love it and I love real food! Thanks for the opportunity to share! I love going to the farmer's market and finding new and exciting things, like the currants! That is really cool. Sounds like your market has some wonderful things. I've only been to the market once this year, but I was pretty psyched to find the mulberries. (I hadn't ever seen them before). I've seen currents, but never tried them. Actually... I think the only place I saw them was Amsterdam. I need to actively look for them and give them a try!! Oh man that proscuitto is calling my name! The currents look great too. I love their deep read color. They're so pretty you can almost see through them. I like! Your kids are too cute- great photos. Oh, what beautiful farmers market finds! I love the pictures and the kids are adorable! I tried currents for the first time about a year ago and loved them, but I never thought to pickle them - I will definitely have to try that! Thanks! Lucky you to find red currants! Cool idea to pickle them. 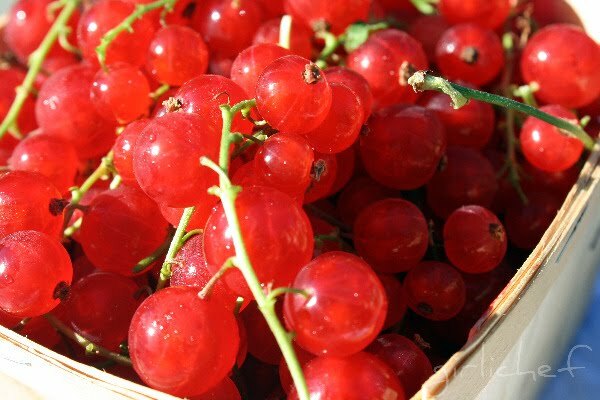 I've only ever had them in jelly (love red currant jelly) but come to think of it, I bet they'd be fabulous in pie! I just posted my soup to the round-up! Love the sour face in that picture! They are tart little devils, aren't they? 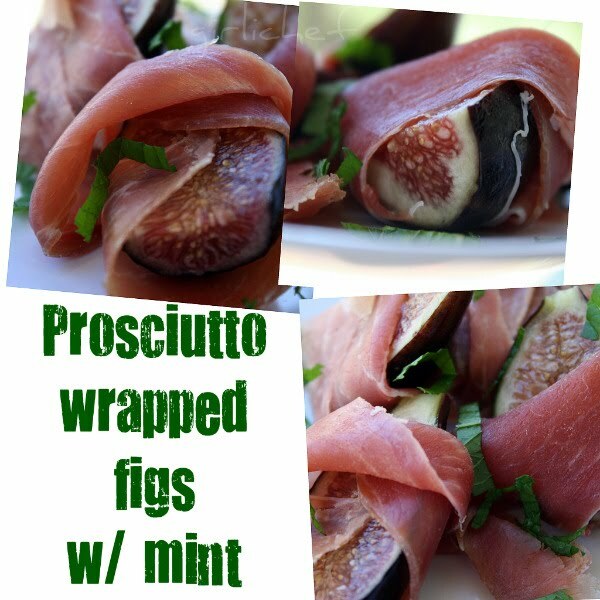 The figs in proscuitto look divine! I haven't seen red currants in my farmers market yet. And I'm envious that prosciutto is available in yours. I would love to be able to buy that each week. Nice post and wonderful photos. i've never tried currants fresh, hopefully we'll get some this summer. This is the first time I've used the linky for Two for Tuesdays, I can't believe how easy it is! Thanks for reminding me Heather!